My workplace relies heavily on Google Documents and GMail right now, and so something like goobook should come in handy. What you see there is very primitive, but as I understand it, goobook is mostly intended as an ancillary tool for mail agents, like mutt or perhaps alot. Adding goobook to those tools means you can manage Google contacts without the need for a browser as an intermediary. Which is always a good thing. goobook needs a little configuration before it can get started; at the very least, you can add your e-mail address and password to .goobookrc, and if you need more help than that, It will generate a template for you with goobook config-template > .goobookrc. I was able to get to most of goobook’s functions just by uncommenting and editing two lines in that file, although the help pages show how to properly encrypt your password and so forth. 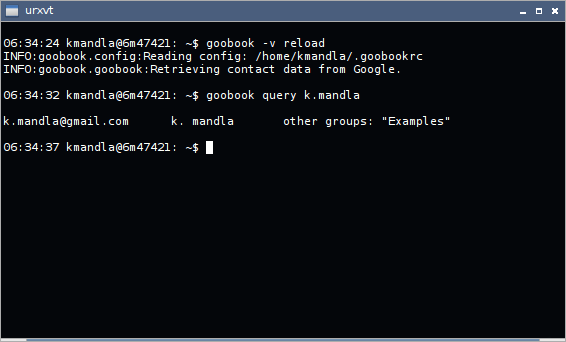 From there, you should be able to build your local cache (or refresh it) with goobook reload. 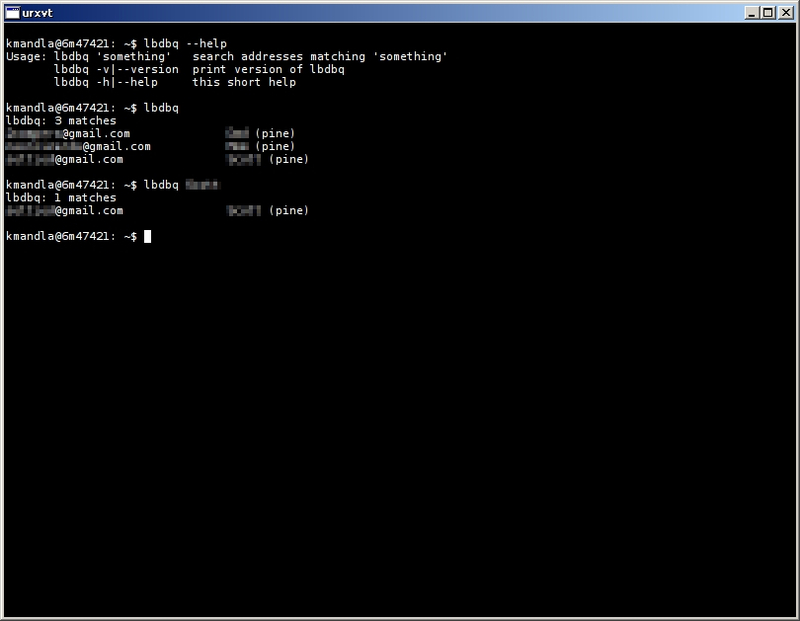 Adding addresses works with goobook add, and so forth. goobook probably looks simple and for what I’ve seen, it is. 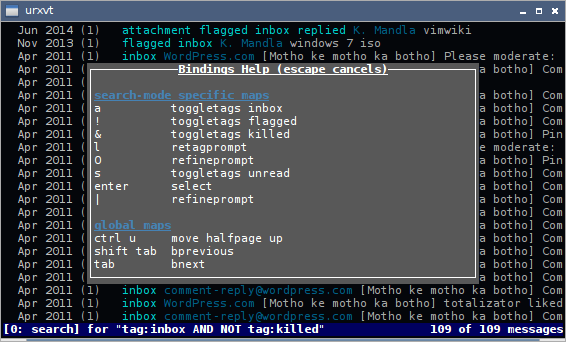 But I also feel like the usefulness with goobook is in splicing it with your mail client. So don’t mark it down just for seeming basic. That’s probably intentional. This entry was posted in Linux and tagged address, addressbook, client, e-mail, mail on 2015/04/17 by K.Mandla. I am completely unfamiliar with citadel or its supporting community, but was told by a long-time reader of this site that it had a long list of console goodies tucked under one title. This I find to be very true, although I suspect that my cursory efforts to get it up and running didn’t really expose me to more than a fraction of its potential. citadel offers e-mail, messaging, calendar and other software bundled as part of a groupware project that has evolved through the 1980s and 1990s. This much I deduced from the descriptions on the Debian and AUR pages. 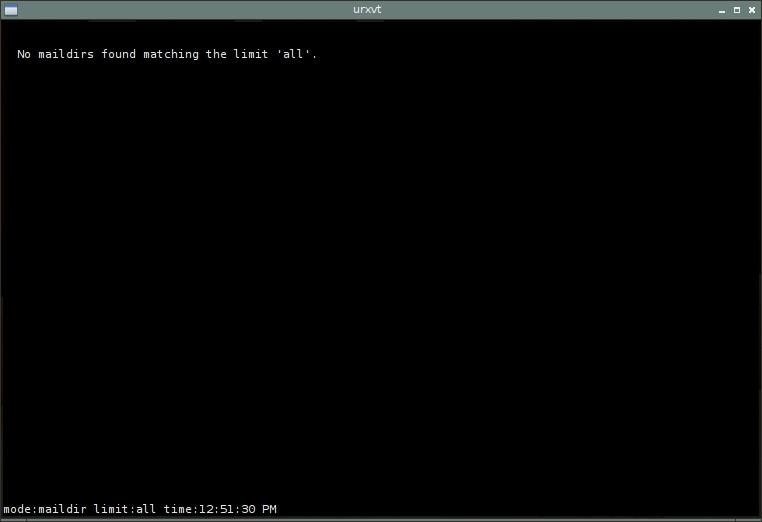 If it looks like BBS interfaces from those decades, it did to me too. I never connected citadel to a live system, so the image you see above is just looped back into my own address running the daemon in Mint (my Arch builds didn’t work). I did that partly because I am a shy and timid creature , and I wanted a chance to explore without an information overload. The downside of that being, as you can see above, there’s not much in the way of real data shown. I can navigate the “rooms” and “floors” of citadel and access a few of the features, but my safe little sandbox doesn’t do much in the way of real interaction. I leave it to you to connect citadel and put it to real use; for what I see from elsewhere on the web, there are companies that use citadel or a variation thereof as a means of collaborating between developers in different geographic locations. So it may be that you use it already. This entry was posted in Linux and tagged address, bbs, calendar, e-mail, groupware on 2014/12/11 by K.Mandla. That’s because the author’s own screenshots are so much better. 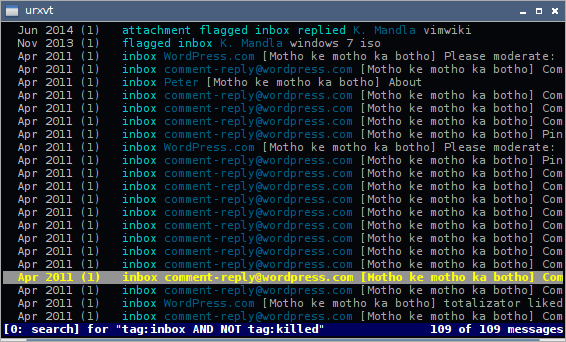 And because I’m stuck in that gray zone of mail clients again, this time with one that is specifically written to only handle local mail directories. And again, since I primarily work with five or six online mail services, I’d need to bring in something like offlineimap or maybe isync or fetchmail to bring all those emails down here, and then configure lumail to work with them. For what I can see from from the web site and from building and running lumail, it does look like a viable option for anyone with a local mail system to navigate. I can’t say how much better it would be than any of the inborne emacs clients or sup or even mutt, but if you’re in that group of users, it might be worth investigating. You can probably do better than I did here. 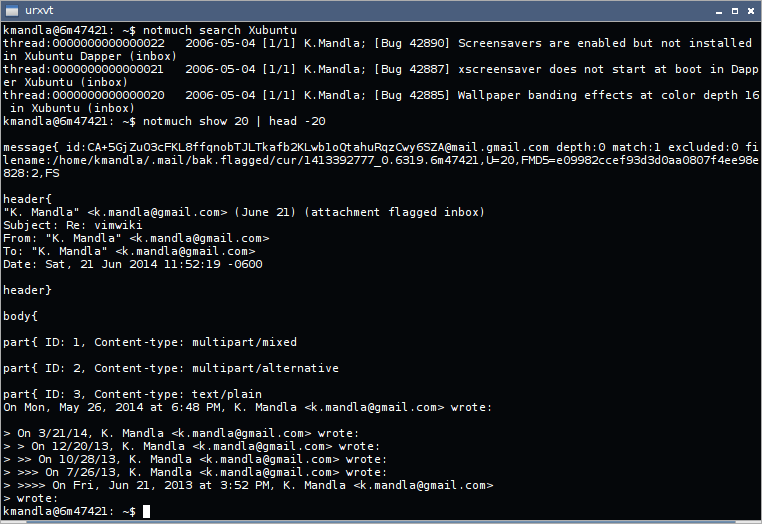 Advanced users will probably want to look at this page, for some of the more complex interactions lumail can engage in. These might also spark your interest. 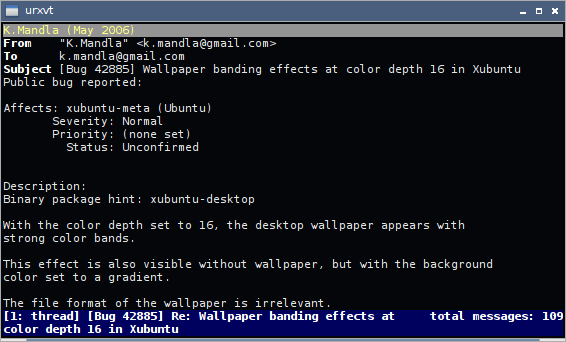 This entry was posted in Linux and tagged client, e-mail, mail, reader on 2014/09/14 by K.Mandla. 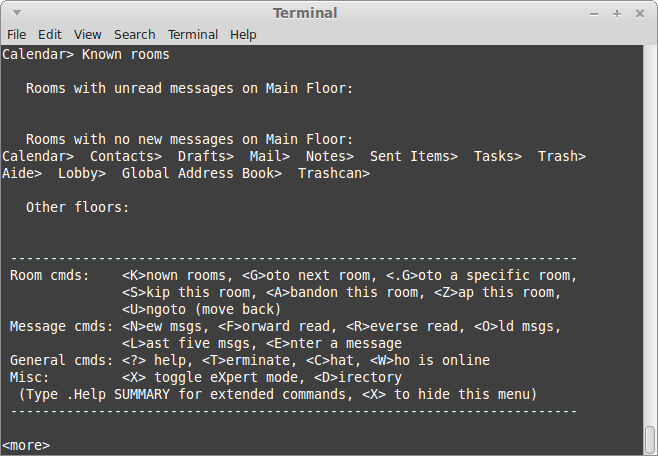 I mentioned bbdb last week along with charrington, as an address book tool for within emacs. Out of fairness, I feel I should mention lbdb as well, although it doesn’t look like much from where I sit. lbdb, for what I can tell, is mostly a search tool for address books, whether created by your system or by other software. As a scientific guess, I would reckon from the configuration file that lbdb is prepared to scrape through about a dozen different address files and mail systems, as well as your /etc/passwd and other local system files, to find the person you’re looking for. Above you can see what little there was for it it search in my .addressbook file, created by re-alpine and compatible with its “m_pine” search method. You’ll need to copy /etc/lbdbrc to .lbdbrc, add the method you need to the METHODS line, and make sure that the remainder of the variables in that file match your setup. 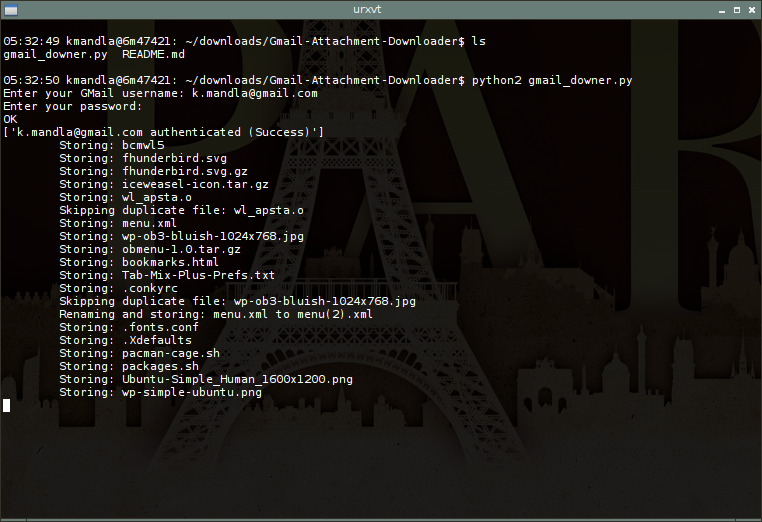 For example, since my .addressbook file is actually at ~/.addressbook, I didn’t need to adjust line 84. After that, lbdbq "name" would search through the file and return anything matching “name.” Easy as that. But also as simple as that. I experimented with lbdb and its incorporated tools for about a half an hour, but what you see in that screenshot above is about the best I got out of it. I know it’s not very impressive, but my .addressbook file is not very impressive either. If I had a few more names and addresses, then I would probably find lbdb a little more useful. And of course, if you’re working on a system with a multitude of address and e-mail tools available, for several users or perhaps multiple systems, lbdb might give you more pause than it did for me. This entry was posted in Linux and tagged address, address book, address books, e-mail, mail, search on 2014/08/25 by K.Mandla.